At Paris School, excellence is our standard! Our small school produces BIG results. Our School Board, Administration, educators, and staff are 100% dedicated to creating success. Our unmatched commitment to kids produces a challenging, nurturing, and safe learning environment in which students flourish and outstanding achievement thrives! 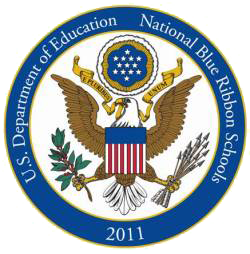 In 2011, the U.S. Department of Education recognized Paris School’s high academic achievement with the National Blue Ribbon Schools Award for Educational Excellence. Paris School was one of only two schools in Wisconsin to receive this prestigious and coveted honor that year. Our school celebrated this exciting award in several ways: Paris School Board members committed personal funds for a commemorative plaque to display in the school foyer; Paris School District Administrator declined an invitation to Washington D.C. to accept the award in person and requested instead that district travel funds be utilized for the purchase of ipad technology for students; and, finally, the Paris School Organization sponsored plaques for all administration, faculty, and staff and sponsored an all-school celebration assembly complete with keynote speaker Marcus Hanel, the Milwaukee Brewers' bullpen catcher followed by cake for all! Paris School is a proud recipient of the Project Lead The Way (PLTW) Distinguished School Award (2017-2018) for middle school achievement. Project Lead The Way is a nonprofit organization that develops K-12 curriculum in the areas of science, technology, engineering, and math (STEM). 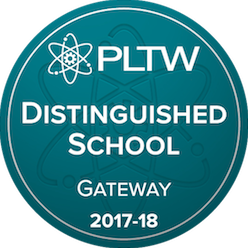 To receive this distinguished honor, a school must meet the following criteria: offer the PLTW Gateway unit to all middle schoolers, have more than 50 percent of middle school students participating in PLTW classes during the previous school year, and have 25 percent of eighth grade participate in at least two PLTW units prior to advancing to high school. Each year, the Department of Public Instruction (DPI) produces an Accountability Report Card for every publicly-funded school and district in Wisconsin. These report cards include data in the areas of Student Achievement, Growth, Closing Gaps, and Post-Secondary Readiness and assign the school/district one of five Overall Accountability Ratings: Significantly Exceeds Expectations (83-100), Exceeds Expectations 72-83.9), Meets Expectations (63-72.9), Meets Few Expectations (53-62.9), Fails to Meet Expectations (0-52.9). Paris School EXCEEDS EXPECTATIONS with an Accountability Report Card Rating of 79.7 for the 2017-2018 school year. The data in each priority area is analyzed by Paris School Administration to prioritize educational needs unique to our Paris School learners. Paris School District receives a 5 out of 5 star rating and is ranked 39th out of 424 Wisconsin school districts analyzed at www.schooldigger.com a national website that evaluates elementary, middle, and high school achievement throughout the United States. This site utilizes data from the National Center for Education Statistics, U.S. Department of Education, and Wisconsin Department of Public Instruction to make ranking determinations. We invite you to read our annual School Board Newsletter and financial report. In 2018, Paris School received a $20,000 safety grant from the Wisconsin Department of Justice. These funds were used to purchase twenty surveillance cameras currently in use throughout our school building. This system enables Paris School Administration to effectively monitor building activity and entrances during the school day. In addition, the Kenosha County Sheriff's Department Mobile Crisis Response Center has full access to the cameras if a crisis situation should arise. Additional cameras are planned with wiring generously donated by Computer Medix, Paris School's IT support partner. A grant from the Paris School Foundation paved the way for installation of a main entrance audio-visual intercom for building admittance during school hours. This technology provides yet another layer of vigilance to our diligent supervision and constant awareness each and every school day.